In many ways, I have come to believe now, that the attitude to water defines civilizations. Water, wind, sun and rain, (in their many forms and their many consequences) have through the ages governed how and where we live. They have directed choices of place – for dwelling, for ablution, for cultivation, for congregation and safekeeping, for control and for protection. And the many great cities of civilized cultures have built themselves around these ideas. And chiefly around the idea of water – as sustenance, as waterway, as beauty and as defense. I recall visiting villages, still without bathrooms or toilets, where the places for bathing, and biological function were carefully separated and placed along the same life giving stream from which they drew water for cooking and drinking. The spot for the daily ablutions was always down stream, away from any point of the village's access to the stream. One looks at the City of Delhi, and it becomes clear how over time the city, seems to have turned its back on the waters it drew its initial reason of being from. The Yamuna is a ghastly sight and smell. But that is not what got me started on this line of thought. It is elsewhere, on the high point of Mehrauli the oldest of the still living historic cities that make up Delhi as we know it. I was standing on a balcony overlooking the Shamsi Talaab, a large water tank, flanked by the majestic Jahaaz Mahal, looking out over a thousand years of Delhi, the talab, broken mosques in ruin, new mosque in white and green, the Mehrauli Gurgoan road and the Metro. But right before me, the Talaab, stood walled, a 5 ft high stone wall, and then a metal grill that keeps only people – not plastic bags with rubbish, and waste and disposable bottles- out. The bank of the Talaab is littered with plastic, and packaging, and other such non-bio-degradeable waste of modern consumer culture. Thrown directly into, or around the very waters that have for centuries made living on the highest point of Delhi both safe and favoured. 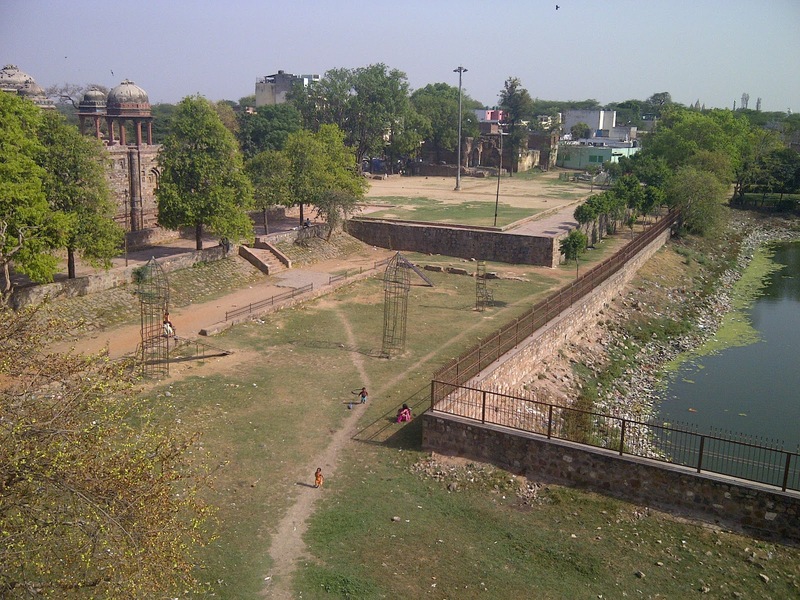 The fence, the only recognizable presence of the Archeological Society of India, only helps reinforce and reinstate the idea that the tank is a rubbish dump. Everything else is allowed access to the water but the people to whom it historically has belonged. This alienation – of culture, of people, and possibly of humanity itself – from the sources of its sustenance on a planet of meager means, this is slowly becoming the single most definitive idea of Modern civilization. And yet we cry ourselves sore for “Green” buildings, sustainable design, and a better city. Yet we will continue to litter our streets, we will throw plastic into every river and pond. Like all things, like everything, its all begins at home, right at your door step. I remember once while in Thimphu, visiting family friends, I went for walk in the forests above the Radio Tower, a good hour and half way up the hill to a small temple. On the way back, one of the two I was with took out a big bag, and then with sharpened stick picked off the forest floor proceeded to spike and collect every piece of plastic/ paper and waste we could spot. Once a week she did this, and that week I joined in too. We cleaned a small path in a forest that had stood and nurtured Thimphu as long as it had existed. Which brings me back to where I began, the pond, and the waste on its bank, and a wall, and community that lives around it that does nothing. Only adds to the waste, and watches in in-action as it is blown by the wind, and strewn across the park and infront of their houses on the parking street. How do we change that? How do we, join all the dots that were once joined, but have been systematically un-joined. Technologies are only a part of the answer, much of the answers lie at home, inside and outside our doorways, in the way we choose to ignore and accept, in the way we have chosen to live our insular, self-referenced and inward looking lives. 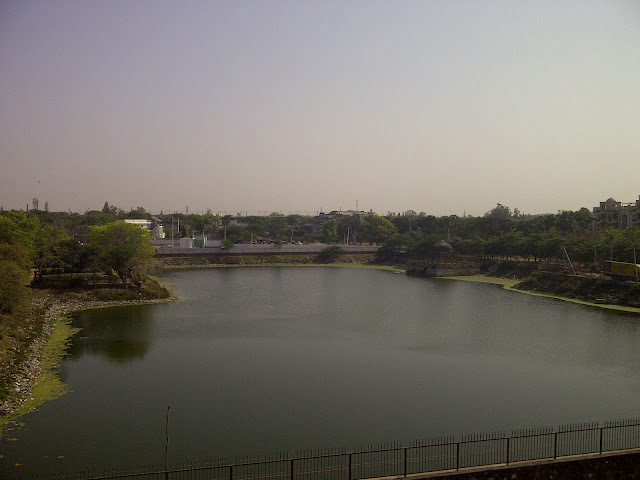 If you walk past Samsi Talaab, give it a look and think, or if you cross the Yamuna too. And then I hope you will travel to Pilang or some far off place, miles away from any road, and see how differently they treat water, and maybe I will not need to make any more of this argument.